Dietary Supplement. Enteric Coated No Fishy Repeat. Pure Source of Omega- 3s. Dietary Supplement. 100% Pure Salmon Oil. Pure Source of Omega- 3s. The historic Alaskan frontier makes a wonderful setting for romantic adventures. Trek into the wilds alongside three women who have strong faith, determination, and no need for a husband. Can they surrender their independent hearts when love comes to call in the form of a friendly neighbor, a grieving widower, and a secretive gold miner? 100% Alaskan Salmon. Considered as Dietary Supplement. Defined By Nature. Gluten, Wheat & Dairy Free. Heart Healthy. 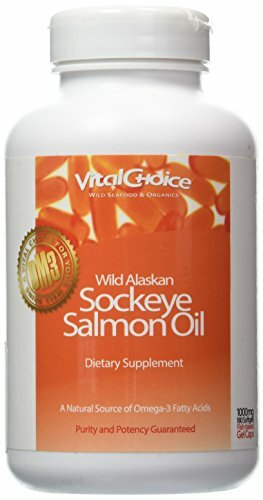 Provides Sockeye Salmon Oil, Vitamin D3 & Astaxanthin. 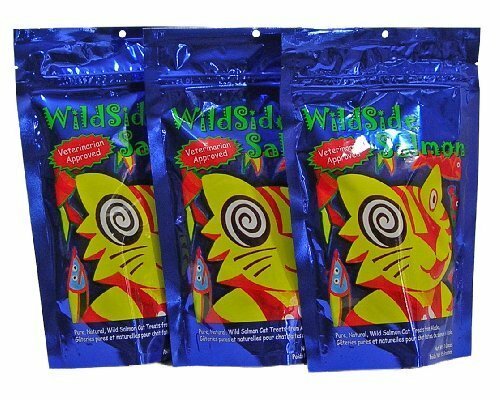 Pure, Wild Alaskan Salmon Oil. Since 1947. Tested For Optimum Purity & Potency. 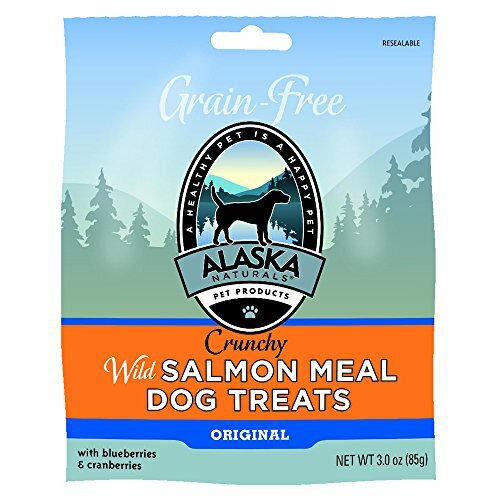 Cat Man Doo Wild Alaskan Salmon is a healthy, organic treat your pet will love! Cat-Man-Doo Freeze Dried Alaskan Salmon is available in a re-sealable, stand-up bag. This naturally organic treat is another healthy way to reward your pet. These treats are completely free of grains and fillers. Derived from a single protein source, you can feel good about rewarding your pet anytime. These crunchy cubes will satisfy your cat's craving for fish and keep her begging for more! * Not for human consumption. 100% Pure Salmon Oil. Considered as Dietary Supplement. Pure Source of Omega-3's . Purity & Potency Guaranteed. 100 recipes from 25 top chefs-- with beautiful full-color photographs Americans today each consume an average of more than sixteen pounds of fish and shellfish annually, with seafood consumption rising at a yearly rate of 15%. For the health-conscious and flavor-conscious, wild Alaskan seafood is an ideal choice--light, naturally low in fat and yet high in omega-3 fatty acids, and succulent to the taste. Despite a sluggish national economy, the state's catch remains in high demand. In "Wild Alaskan Seafood, " twenty-five of America's finest chefs--among them, four James Beard award winners: John Ash, Bradley Ogden, Holly Smith, and Allen Susser--share their favorite recipes using the Last Frontier's wild, natural, and sustainable seafood. With full-color photographs of food and Alaskan locales throughout, this book is a beautiful and useful keepsake for anyone with a passion for the state's incomparable catch, as well as all visitors to, and lovers of, the Last Frontier. James O. Fraioli is the award-winning author of nine cookbooks, the first of which, "Ocean Friendly Cuisine: Sustainable Seafood Recipes from the World's Finest Chefs," received numerous honors, was presented at the White House, and was featured in the "New York Times" and on the Food Network." "His cookbooks have also been featured on Martha Stewart Radio, the Ellen DeGeneres Show, and in "Bon Appetite, Food & Wine, "and" Saveur." His Web site is jamesofraioli.com, and he lives in Seattle, Washington. With a body twisted by adolescent scoliosis and memories of the brutal death of a woman he loved, Lynn Schooler kept the world at arm's length, drifting through the wilds of Alaska as a commercial fisherman, outdoorsman, and wilderness guide. In 1990, Schooler met Japanese photographer Michio Hoshino, and began a profound friendship cemented by a shared love of adventure and a passionate quest to find the elusive glacier bear, an exceedingly rare creature, seldom seen and shrouded in legend. But only after Hoshino's tragic death from a bear attack does Schooler succeed in photographing the animal -- completing a remarkable journey that ultimately brings new meaning to his life. "The Blue Bear" is an unforgettable book. Set amid the wild archipelagoes, deep glittering fjords, and dense primordial forests of Alaska's Glacier Coast, it is rich with the lyric sensibility and stunning prose of such nature classics as Barry Lopez's "Arctic Dreams" and Peter Matthiessen's "The Snow Leopard." In Wild Alaskan Seafood, twenty-five of America's finest chefsamong them five James Beard award winners:Holly Smith, Bradley Ogden, John Ash, Christine Keff, and Allen Sussershare their favorite recipes using the Last Frontier's wild, natural, and sustainable seafood. For Nancy Lord, what began as a yearning for adventure and a childhood fascination with a wild and distant land culminated in a move to Alaska in the early 1970s. Here she discovered the last place in America "big and wild enough to hold the intact landscapes and the dreams that are so absent today from almost everywhere else." In "Rock, Water, Wild," Lord takes readers along as she journeys among salmon, sea lions, geese, moose, bears, glaciers, and indigenous languages and ultimately into a new understanding, beyond geographic borders, of our intricate and intimate connections to the natural world. Vast and beautiful, and much more than a mere place, Alaska is nonetheless inescapably a land of natural extremes and exquisite subtleties. In Lord's explorations, "the country" of Alaska evokes reflections on the importance of place and space in our lives; arguments over roads carved in the wilderness; musings on the role of location and landscape in the Dena'ina Athabascan language; accounts of sport fishing in the Russian Far East in the first days of perestroika and of climbing in the Arrigetch Peaks of Alaska's Brooks Range; and considerations of the politics of whaling. In the tradition of naturalists John Muir and John Burroughs, Lord proves an excellent guide to the challenges and pleasures of making oneself at home on this Earth. Salmon oil provides a rich source of natural Omega-3 essential fatty acids that supports and promotes healthy skin and glossy coat, a healthy immune system, cardiovascular health and healthy brain development. 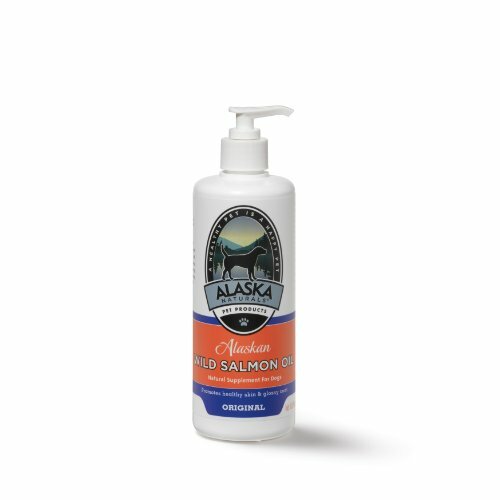 Alaska Naturals salmon oil is stabilized with natural rosemary extract to maintain freshness and taste. Dog Salmon Oil provides a rich source of natural Omega-3 essential fatty acids that supports and promotes healthy skin and glossy coat, a healthy immune system, cardiovascular health and healthy brain development. And, our oils are stabilized with natural rosemary extract to maintain freshness and taste. Alaska Naturals provides natural, USA-made, chemical-free wild caught fish oil pet products. Our quality-assurance team is involved from the source to the shelf using our sophisticated processes and our genuine concern for producing the very-best pet supplements. Suggested Use: 1/2 teaspoon per 10-pounds of body weight daily. Ingredients: salmon oil, rosemary extract. Guaranteed analysis per teaspoon: crude fat 99.5-percent, moisture (max) 0.5-percent. 15.5-ounce pump bottle. It all starts with the sustainable harvest of wild salmon in the cold and pristine waters of Alaska. Cold processing preserves all the beneficial nutrients of the salmon. The result is a fish oil that contains the purest omega-3s in a naturally balanced state. Pure Alaska Omega Salmon Oil is the only naturally balanced fish oil, delivering omega-3s "as nature intended". It is better for you. Better for the environment. Better all the way around. The skin is the body's largest organ system and helps control internal temperature and serves as a reservoir for certain nutrients. The hair coat insulates the body and shields the skin from injury due to sunlight, heat and irritants. Nutri-Vet skin and coat supplements provide essential fatty acids, minerals and vitamins for soft, silky, shiny and healthy coats and reduce unwanted shedding. Nutri-Vet Wild Alaskan Salmon Oil provides levels of both omega-3 and -6 fatty acids not commonly found in pet foods. This pure oil is made only from wild, non-farmed Alaskan salmon and stabilized with natural antioxidants to maintain its fatty acid content and taste. Food-grade, inert silica is added to help reduce drip and odor. Nutri-Vet’s salmon oil provides a daily supplement rich in EPA and DHA that helps maintain healthy skin and coat condition and promote a strong immune system. Great salmon flavor dogs love. Our unique supplement provides a healthful combination in each 3-softgel daily serving ... 600mg omega-3s + 3000 IU Vitamin D3. 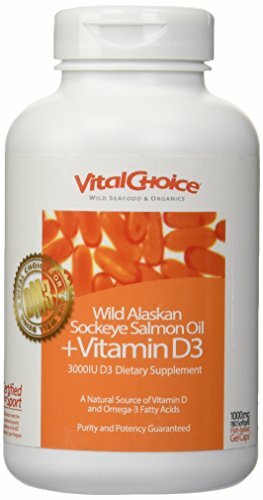 Omega-3s naturally abundant in our whole, unrefined, certified-pure Wild Alaskan Sockeye Salmon Oil, to which we add an ample dose of natural Vitamin D3. As well as enhancing general health, omega-3s and vitamin D support the extreme physical and mental demands placed on serious amateur and professional athletes. So that they can benefit from both, worry-free, we sought the prized Certified for Sport seal of approval from NSF, which assures athletes that our supplement is free of all substances banned by sports federations worldwide. All Vital Choice Salmon Oil and Vitamin D supplements are made from the same pure, natural ingredients, in the same way ... but only our Salmon Oil + Vitamin D3 supplement is Certified for Sport by NSF. Leading sports leagues and associations, including these, have authorized their athletes to use NSF Certified for Sport supplements: • Major League Baseball • MLB Players' Association • National Football League • NFL Players' Association • The PGA and LPGA • Canadian Center for Ethics in Sports The NSF Certified for Sport program enforces four key provisions and provides continual monitoring to ensure compliance with substance prohibitive lists promulgated by WADA, NSF Annex A, NFL, MLB, and NCAA: Banned substance screening for products intended for professional and elite athletes. Good Manufacturing Practices audits of the production facility. Toxicological reviews of the product's formulation and substantiation of any product claims. Annual label claim tests to ensure the product is meeting its declared nutritional values and is free from microbial and heavy metal contamination. We are proud to partner with NSF to bring high-quality, all natural supplements to athletes serious about their sport and their health.